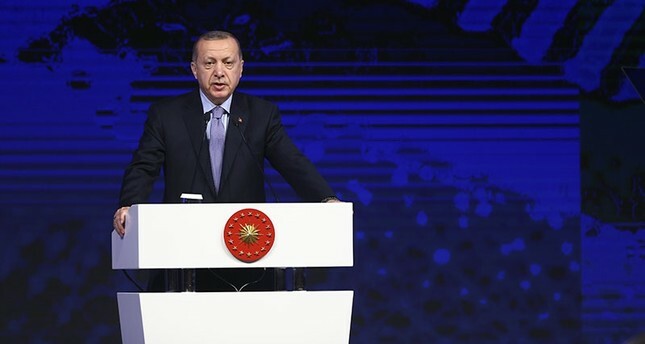 President Recep Tayyip Erdoğan on Monday criticized that joint air and missile strikes targeting the Assad regime in Syria came only after the alleged chemicals weapons use in Douma, while millions have been killed or displaced during the seven-year-long bloody conflict. “I wonder how many people that these imperial powers taken in from Syria during process. Well, they did not take any. But Turkey harbors 3.5 million people,” Erdoğan said at the Global Entrepreneurship Congress in Istanbul. “But what did they do? They came and struck, citing chemical weapons. Those children [hit by chemical weapons] come to us. I see the conditions that those children are in, others don’t. The only thing they insist on is that ‘we have struck due to the use of chemical weapons.’ Why do you only consider chemical weapons, why don’t you consider conventional weapons? If one died due to chemical weapons use, 10 others died by conventional weapons. [They] just look at those who were killed with chemical weapons. Is this justice?” Erdoğan said. The U.S., the U.K. and France hit Syria with airstrikes early on Saturday in response to a suspected poison gas attack that killed more than 70 civilians last week, in the biggest intervention yet by Western powers against Syrian regime leader Bashar Assad. Turkey has supported the airstrikes in Syria, and almost all messages urged for a political solution, reshaping Syria’s future without regime involvement and international determination against the use of violence against civilians rather than conducting a single and limited action.